Tata Power Delhi Distribution Limited (Tata Power-DDL), India’s leading power distribution company serving a populace of 7 million in the national capital, and Green Business Certification Institute (GBCI), a US based global credentialing and certification body working in the domain of green, sustainable and energy efficiency initiative have signed a Memorandum of Understanding (MoU) today in New Delhi to establish a strategic partnership to promote, implement and accelerate the uptake of smart grid technologies and sustainable power system in India, Asia, Africa and Middle East. The MoU aims to bring together relevant technical competencies and share resources, tools and information more efficiently. 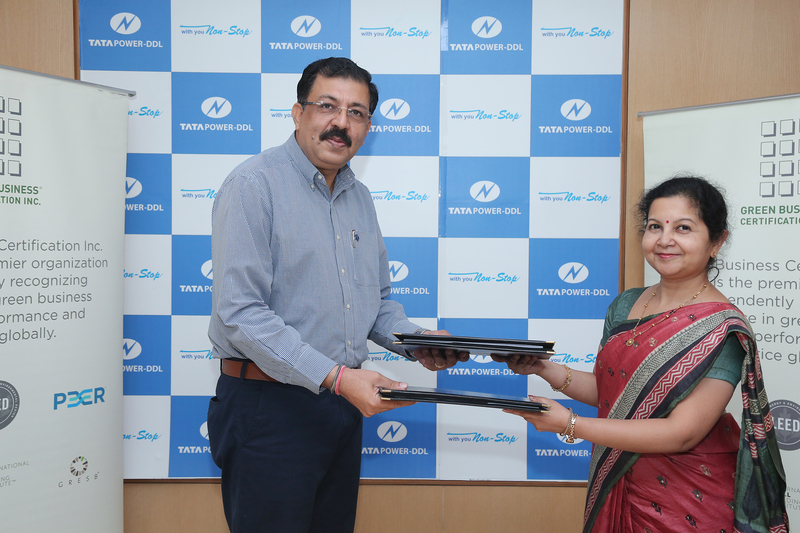 The MoU was signed by Mr. Sanjay Kumar Banga, CEO, Tata Power-DDL and Ms. Mili Majumdar, MD – GBCI, Sr. Vice President – USGBC. The main thrust of the MoU is to work jointly for the achievement of common goals and utility objectives related to identification of opportunities for applications of Performance Excellence in Electricity Renewal (PEER) – a comprehensive, consumer-centric, data-driven system for evaluating power system performance and to promote sustainable power. It also emphasises on promotion energy efficiency and smart grids. Ms. Mili Majumdar, MD – GBCI, Sr. Vice President – USGBC said, “ We are privileged to partner with Tata Power Delhi Distribution Limited to steer certification of sustainable power systems in India. As the world’s first certification, PEER measures and helps to improve power system performance and energy infrastructure . We work with multiple stakeholders across the world to help them transform the power sector and now we will be jointly working with Tata Power- DDL towards a common goal of providing sustainable power for all”.